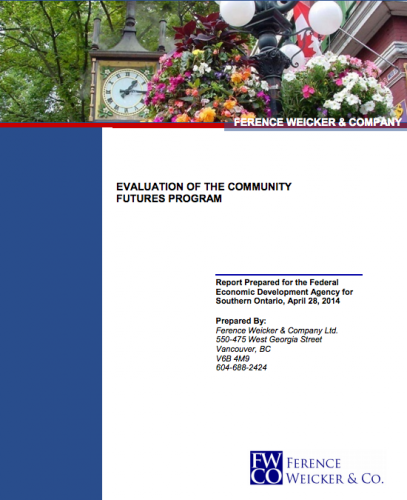 Established as a national program in 1985, the Community Futures Program (CFP) has been administered in southern Ontario by the Federal Economic Development Agency for Southern Ontario (FedDev Ontario) since 2009. The objective of the CFP is to promote economic stability, growth and job creation leading to more diversified and competitive rural economies, and economically sustainable communities. In southern Ontario, the program is delivered through a network of 37 Community Futures Development Corporations (CFDCs). From 2009–10 to 2012–13, program expenditures, including grants and contributions and operations and maintenance, totalled $50.31 million. The support provided by FedDev Ontario enables the CFDCs to provide financing and other services to small businesses as well as to work with local partners on community strategic planning and economic development initiatives. The objective of this evaluation is to report on the relevance and performance of the CFP in southern Ontario, in accordance with the 2009 Treasury Board of Canada Secretariat (TBS) Policy on Evaluation, Directive and Standards. The scope of the evaluation includes CFP activities funded from 2009–10 to 2012–13. The evaluation approach is based on the national Performance Measurement Strategy (PMS) approved for the CFP. The evaluation employed multiple lines of evidence including surveys of 512 CFDC clients (309 clients who received CFDC loans and 203 non-loan clients), 79 CFDC representatives (staff and board members of CFDCs) and 73 community partners, interviews with 12 FedDev Ontario representatives and 16 other stakeholders, a document and literature review, analysis of administrative data, and four case studies focused on specific CFDCs. The case studies included document reviews, obtaining additional input from 33 representatives through interviews and focus groups, and an analysis of 110 interviews or surveys already conducted with representatives in the communities.